The Library Module is where you will spend a lot of time importing, exporting, and viewing photos. On the left side panel you have the "Navigator" window, the "Catalog section," the "Folders section, the "Collections section," and "Publish Services." On the right side you have the "Histogram," "Quick Develop," "Keywording," "Keyword List," and "Metadata." I will talk about some of the sections in both panels but will save others for a more detailed description at a later date. You can view your photos as small or large thumbnails in the Library module by sliding the teardrop icon back and forth (bottom right just below the photos on the Toolbar (the bar at the bottom with various items on it, including colored boxes, just above the photo filmstrip ), you can Sync settings (process one photo and use the same processing on other photos) from one photo to the next, use key words, "stack" photos together (group them), import and export photos, and mark photos in a variety of ways, such as using colors, stars or flags. Small icons will be added to your photos as you work with them, they are called "badges," and they show up in the bottom corner, right side as you view the photo, as various processes are applied. For example, the pencil icon means the photo has a key word, the little dotted line icon means the photo was cropped, the +/- icon means the photo has been processed in some way. In the image above, right: Badges include keyword (top left row), in a collection, and processed. (Top row, second photo) A badge for a crop is in the middle of the two other badges. Also note the number at the top of the first photo at the top left: this means it is in a stack; photos can also be with marked color or stars, or flags (top right). "X" means these photos will be deleted at some point. You can view photos using filters (top right of photo screen, "Filters Off" with an up/down arrow) that allow you to set the parameters, such as all photos with stars, or all photos that are marked red, or all photos with stars that are marked blue. In the filter mode you can also quickly view key photo information for a group of photos such as image size, megapixels, or settings at which you took the photo, depending on how you set this up in the View menu across the top of the program. Click on the up/down arrows to view the options. You can also compare photos using the shortcut key "N." Click on both photos to mark them, use the Command/Control key to do this, then hit the "N" key and they will come up on the same screen. You can hit Command/Ctrl "D" to unmark the photos but this will leave the "N" (compare) key still on and if you choose two (or more) photos to compare they will automatically open in the compare window. I usually hit the icon at the bottom on the toolbar that is second from the left and has a large window in a box if I no longer want to compare photos. This stops the compare process. Or, you can use Command/Ctrl "D" to unmark all photos. You can go through photos to delete photos in mass using the "X" shortcut key. With a photo marked in the window simply hit the "X" key. A flag with an "X" in it will show up on the photo at the top left corner. To unmark the photo, hit the "U" key and the flag will go away and the photo will no longer be marked for deletion. Navigator: This panel allows you to see the photo you are currently clicked on and lets you change the view of the photo from Fit, to Full, to 1:1 or some other ration chose by you. Open this panel by clicking on the panel header. The box in the window over the photo being shown allows you to move from one area of the photo to another easily. If you move this box around your photo at an enlarged view you can spot flaws or small areas of blown highlights (an area with no colored pixels captured due to over exposure; the area will be pure white and no amount of processing will bring back color because the color was never captured). 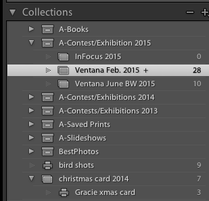 Folders: Folders are the heart of your photography hierarchy system. This panel shows all of the folders on your drive where they are stored and in the same order they are stored. You can add and delete and move folders around from within this panel and when you do this they are re-arranged, added, or deleted on your drive. You can see the total number of photos that you have and the number of photos in each folder. One thing you cannot do is delete an entire folder, which is actually a precaution in your favor. To delete an entire folder you need to click on the folder to bring up the photos, mark all of the photos (command/ctrl A), then hit the delete key. After deleting all of the photos you can remove the folder by clicking on the "-" icon at the top right of the folder panel. You can create a new folder by clicking on the "+" sign and then moving it to where you want it stored. Every action you take in this panel is applied to your actual photo files on the disk. Do not ever re-arrange your photos on the hard drive, do it all from LR, or you'll find yourself faced with the dreaded "question mark" on your files and having to link everything up again in LR. Collections: From this panel you can create collections, a collection is simply a file created for a special purpose that can be used and deleted as needed. You never delete your photos when you delete a collection. There are several types of collections. These special files are great to use when creating a slide show or book or when you want to show someone a specific set of photographs. A regular collection can be arranged in the order you want to meet whatever your need is for the photos. Once you create a slideshow or a book or a print file you can save it for later use, then you can delete the original collection and use the saved version. Or, you can keep collections that you might need to refer to at some other point in time and put them away in a collection set, which is a digital file cabinet. To create a collection, click on the + icon that is located at the top, right side of the collections panel. Several choices will pop up, simply click on the one you want. If you choose a collection set, you can drag individual collections into it. LR also comes with several Smart Collections already in place. For example, Colored Purple, Colored Red, Five Stars. You will find these in a Smart Collection Box in the Collections panel. I've stacked and processed these photos and marked the ones I like with 5 stars. My Work Flow: After I link up a new set of photos using the import button, being sure to read absolutely every instruction on the entire import page, I view all of the photos looking for likely culprits to delete. I only mark photos for deletion that are blurred or just plain bad or were obviously a test exposure photo or an accidental photo of my foot or the ground, which happens every so often. I mark these photos by hitting the "x" shortcut key. To delete these photos I hit Command/Control+Delete (or you can go to Photos>Delete Rejected Photos) and a box comes up asking me if I want to remove the photos from LR or if I want to delete them from the disk. I always want to delete these photos from the disk so I click on that button choice. During my second sort I go back in and look again at my photos. If I've taken multiple photos of a subject, say I bracketed for focus and exposure, I'll "stack" these photos together since they are the same subject. This is done by marking all of the photos (click on the first one, hold down Shift the entire time and click on the last photo) and hitting the Command/Control+G shortcut key or going to Photos>Stacking>Group into Stack. You will see a number in the photo itself that represents how many photos are in that stack. You can re-arrange the photos in the stack by clicking on the number, clicking on the number of the first photo closes and opens the stack. This helps me to narrow down the number of photos I'll be considering as keepers or throw-a-ways and helps me focus on the task at hand without being overwhelmed by having hundreds of photos opened at the same time in Library mode. Then I get serious, the final pass is all about composition and focus. It's important to me that my photos are in sharp focus, so I click on a photo and then hit the 1:1 ratio key at the very top left in the Navigation panel to really look closely at the photo. If it's out of focus (really soft or blurry) nothing can fix it for me; if it's not in focus I hit the X shortcut key and move on. I do this for all photos that I think are keepers. Sometimes, if I'm not sure about the worthiness of the photos I'll mark it in a color in order to review it again later on. You do this by clicking on the photo and clicking on a color box at the bottom toward the left side (toolbar just above the film strip of photos). Click on the same box again and the color goes away. At the end of this final pass I'll have a lot of photos that are marked with an X and I delete all of these photos at one time from the hard drive using "Command/Ctrl+delete. After this process I start to edit the photos I think are worthy of keeping. I always have a group of photos that I don't delete (but should!) and that I don't edit but are not bad enough to toss so I just let them sit for awhile: sometimes I go back later and either edit or toss these photos. 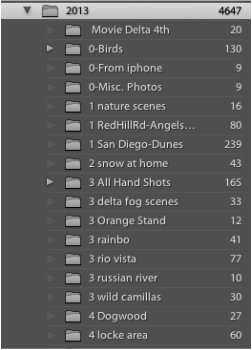 I always edit a batch of photos for each shoot and normally end up with 30 to 100+ photos, depending on the shoot, that are processed and ready to go. Working this way is what has allowed me to learn all about LR and I always have photos at the ready when I need them. I never have to go through my photos and process them at the last minute. I also keyword these final photos so I can locate them that way as well if I forget which folder something is in. If you cannot remember if you put a keyword on a photograph, you can go to the Smart Collection folder that came with the program, open the collection box by clicking on it, then clicking on Without Keywords and every photo without key words will show up.